Two of the most expected movies, MCA (Middle Class Abbayi) & Hello, are all set to hit screens on 21st and 22nd of December respectively. 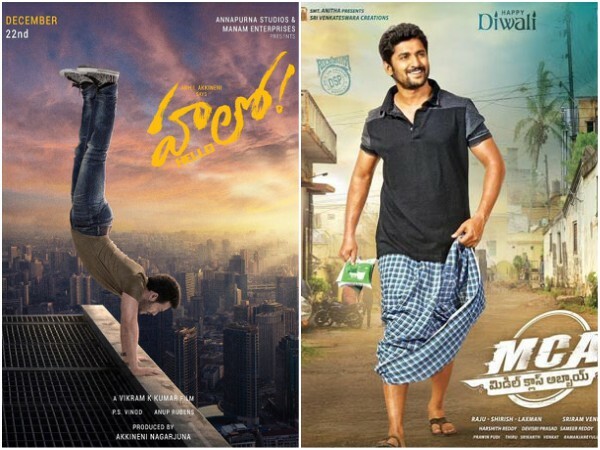 While Akhil Akkineni is eyeing a mighty comeback with Hello, Nani is all set to score yet another hit with MCA and thereby continue his successful winning streak. Akhil’s debut vehicle, Akhil-The Power of Jua, released amidst much frenzy & anticipation. Though the Akkineni successor proved his abilities, the movie did not compliment him with a favourable result. Hello, is seen as a comeback movie like a boomerang to the young hero. Hello is touted to be a content driven movie and not another run-of-the-mill plot. Creative director, Vikram Kumar of Manam fame, is said to have knitted an engaging script who has also called action-cut for the movie. During the audio launch event of Hello, the cast and crew of the movie were seemingly confident about the movie’s performance at the box office. However, it was Nagarjuna, father of Akhil and the producer of the movie, who was extremely confident about hitting the bull’s eye this time around. The pre-release business statistics have been impressive. But it is also to be noted that more money involved induces more risk. Nizam- 9 Cr, Ceeded- 4.5 Cr, Vizag- 3.2 Cr, East- 2.2 Cr, West- 1.8 Cr, Krishna- 2.1 Cr, Guntur- 2.6 Cr, Nellore- 1.1 Cr, Rest Of India- 0.5 Cr, Karnataka- 2Cr & Overseas- 3Cr, taking the overall tally to a whopping 32Cr. The numbers seem humongous considering the actor’s experience and his previous movie’s outcome. Akhil is way ahead of many contemporary young actors in terms of business proposition. Will he strike the target? December 22nd will answer the question. With 8 consecutive hits in his kitty, Natural Star Nani is all set to take up the tally to triple hat-trick with MCA. Being directed by Venu Sree Ram of Oh My Friend fame, the trailer of MCA gives a gist of a family rom-com genre. The first segment of the movie is sure to be filled with lighter and funny portions, as the combination of Nani & Bhoomika Chawla as brother-in-law and sister-in-law is sure to emulate the Tom-Jerry combination. Nani, with the pre-release figures, has once again proved his star power with the pre-release business numbers. With Christmas and New Year round the corner, the makers of both movies are planning to churn out the best from the brief holiday season.